The Wild West Coast Beach of Muriwai with its Black Iron Sands, over 30 km long, great for fishing, surfing, land yachting, horse riding, kite flying etc. Gannet Colony With Easy Public Viewing. See Paul Hafner's "Gannets at Muriwai"
" THE centre" of the district in all respects. All this as well as vineyards, orchards and craft shops, is only 26 kilometres from the centre of Auckland on State Highway 16. In March each year the Kumeu Showgrounds holds one of the southern hemisphere's biggest one-day shows. A variety of other cultural festivals and events take place in the grounds throughout the year. The district is well known as a centre for breeding and training standard-breds (horses) as well as being a strong competitive equestrian district. 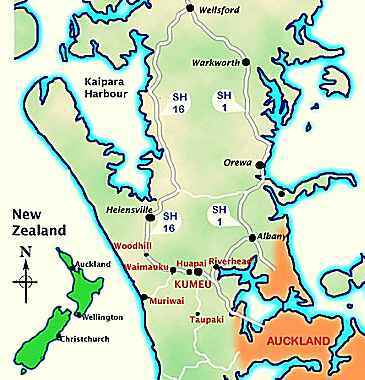 Kumeu-Huapai is also a thriving industrial area. It's businesses support and service many industries including forestry, construction, heavy transport, engineering, marine and viticulture to name but a few. There are numerous outdoor locations which provide great venues for special family events or larger scale television and film settings. Come out West - there's lots of the best ! A spectacular west coast beach that is world renowned for its surf and black sand, and is over 30 kilometres long. It is also home to one of New Zealand's few gannet colonies unique because it is accessible to the whole family - only a few minutes easy walk from a car park area. Muriwai also has its own 18-hole all weather golf club nestled between Woodhill forest and the beach. There is a great motor camp, surf life saving club as well as two shops and a small motel. Everything to make this a great place to escape from the city any time of the year. Goldie's Bush, just a few minutes up the road offers a fascinating walk amongst real New Zealand native bush. Numerous kauri trees overlook your progress as you criss-cross Mokoroa stream. At the northern edge of the district is the large Woodhill radiata pine forest. The forest setting is renowned for a variety of recreational activities such as orienteering, moto-x, mountain biking and horse trekking. (Permits available from Forest HQ) Away from the forest is a traditional New Zealand rural environment with horticulture, dairy, sheep and beef farms. Located at the junction of SH16 and Muriwai Road this is an attractive lifestyle village. Great country living with everything you need - primary school, playcentre, day-care centre, medical centre service station plus shops. Several road-side outlets also offer a variety of fresh fruit and vegetables - healthy " food on the go " as you seek out another adventure in the west. There is also a great function centre offering venues for weddings or other gatherings in an historic building. Just over the hill is another first class restaurant located in a renowned vineyard. One of many in the district. One of the oldest established communities in the west on the banks of the Rangitopuni River. The township derives its name from the fact that it is at the upper limit of the waitemata harbour that the early settlers were able to sail as they explored the river and its surrounding bushland. A museum also offers an insight to the history of its early European settlers. With a school, rugby club, shops and a busy community centre it is classic "small town" New Zealand. A peaceful rural village with a strong sense of history in the areas development. It is only a few minutes from the Waitakere Railway station where the city commuter line ends. A community based around lifestyle blocks there is a primary school and a retirement home to ensure all stages of life are catered for !